Welcome back to Inside the Mind of an NYC VC, a new series at AlleyWatch in which we speak with New York City-based Venture Capitalists. In the hot seat this time is Beth Ferreira, Managing Partner at WME Ventures. Beth spoke with AlleyWatch about working with Fred Wilson and Jerry Colonna at Flatiron Partners early in her career, what she learned as COO of Fab.com, the thing that makes her slam the door on entrepreneurs, the corporate venture capital space more broadly, and much more. Bart Clareman, AlleyWatch: Tell us about your journey into the venture business and how you came to be Managing Partner at WME Ventures? 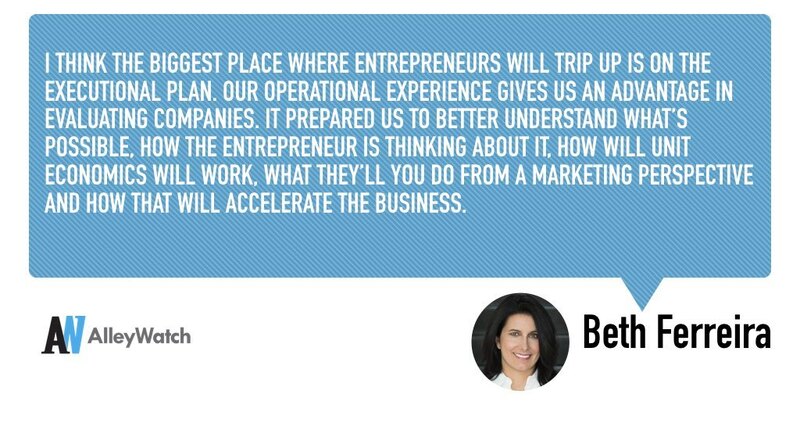 Beth Ferreira, WME Ventures: I worked in the venture capital business early in my career. I came out of investment banking and joined a fund called Flatiron Partners, which was founded by Jerry Colonna and Fred Wilson. I was there for nearly four years in the dotcom boom and through the dotcom crash. It was an amazing experience; one, it was the first time I was working with entrepreneurs who were super excited and in the building phase of their businesses, and two, being in the early days of the internet there was endless opportunity. Post the crash I worked for a fund called J.P. Morgan Partners, who was our limited partner at Flatiron, and then I went to business school. When I went to business school I knew I wanted to be an investor, but thought that getting operating experience would be, one, really rewarding, and two, great experience for being an investor. I went off to business school with the thesis of, “I want to be an operator at the end of this.” Not that it was an easy transition – when I came out of business school, the response was something like, “you were always on the outside, what do you know about being on the inside?” But in the end I was able to get past that. Fast forward to my role at Etsy. Prior, I went to Fred [Wilson] for some advice, as he was just investing in Etsy, and they needed a lot of help across a lot of dimensions and it was the right place and right time for me. Etsy was a transformative experience. We scaled the business north of 15x in my tenure there. I got to play lots of critical roles there while we transformed the business into a household name. I left there and then joined another early stage company, Fab, with, in the early days, a very similar mission of working with designers to scale up their production. At the time, it seemed like a natural extension of what I was doing at Etsy. You know the story of Fab, of course. The thing I was proud of doing there was creating likely the best infrastructure from the perspective of supply chain, buying, and customer service among the flash sales sites. But ultimately when larger strategic decisions that don’t jive with the business that stuff doesn’t matter. Coming out of Fab I was thinking, “do I run a business?” or do something else. I was considering venture capital as I had previous venture experience and had been spending some time with a few venture firms here. When I got the call about what WME was thinking about, I was a little hesitant at first but once I started talking to them it became very intriguing. We’re structured as part WME capital, part outside capital, which keeps us very aligned with our other investors, which is great. From the standpoint of value add there’s a lot of connectedness here from the functional groups that support talent – things like communications and our digital teams. Other examples include brand partnerships that have deep relationships with the Fortune 500, and all of the WME IMG assets – whether it’s IMG or droga5 or New York Fashion Week – each of which are ways we can connect our companies and create potential opportunities for them to get increased exposure, more customers, partnerships, and other things like that. What did you learn from the experience at Fab and how does that experience inform your work with founders today? One is really being realistic about what the growth trajectory of the business can be. As a company, we took a position of “go big” or “go home.” In some ways you could argue that what we were trying to do was impossible, that you can only get growth from so many places. We were already growing fast, but how do you accelerate that growth to be the company that hit $1B in revenue the fastest? The question is, should that have been a goal? There’s the question of how fast you’re growing, but also the question of how solid is the business. Of course you want to grow fast, but particularly in ecommerce it’s all about the unit economics, and if there’s one piece of that puzzle that’s not working – starting with the gross margin all the way down to what your fulfillment costs are and everything in between – it can spiral quickly. Another learning: be very thoughtful about your financing strategy even from the early days. Once you get on the path of accepting large amounts of capital, it’s hard to get off. I was at Fab a month before we got our first $50M check, and that was five months after launch. A challenge for entrepreneurs generally is, there’s an implicit contract between the management team and your funders that you’re going to take that capital and accelerate growth, and you need to have a very clear path of how you’re going to do that. The more capital you take, usually the more growth is expected. But the key isn’t growth at all costs, the key is sustainable growth. I want to talk about WME Ventures in the present but before we get there I want to talk about the history. Part of WME’s history in this space is the Mail Room Fund, which after much fanfare at launch and a partnership with no less an investor than Accel, shuttered after three investments. What legacy does the Mail Room Fund leave behind at WME and what’s different this time around? The company itself is very different today. The Mail Room Fund was in 2008 pre-IMG, pre-UFC, pre a lot of things. I don’t know what the genesis of the Mail Room Fund was, but today the company’s in a different place. WME Ventures differs from traditional corporate venture capital (CVC) in that WME Ventures has LPs. Why is that structure right for WME Ventures where it isn’t for so many of your CVC peers? I think it’s great for our model. The biggest challenge about getting into deals and working with other venture funds is that perception of alignment, and being perceived as corporate will always have a little bit of a challenge on that front. With our structure I can look another investor in the eye and say our incentives are exactly same as yours, which makes for a better place to come into a deal. From the standpoint of putting runs on the board, adding value and demonstrating that value as a partner, is the most important piece. But ultimately we want to be in the position where other firms want us in their deals, whether we are the lead or part of a syndicate. And that’s the sort of thing that makes me slam the door on you. I thought it might! And yet, I have to think there are many founders out there that think WME Ventures and think big celebrity endorsement or participation. Does it ever work that way? Here’s the thing. That kind of endorsement or participation needs to be extremely organic. We can get companies and products in front of clients, but unless they think it’s a really great product, it’s not going to work. We can help from the standpoint of thinking through influencer marketing strategies and who we can connect you with. Ultimately you need that spark. If that spark is not there, it’s a hard to make the influencer strategy work. There needs to be another reason for the influencer to want to participate, particularly in early stage businesses. Those reasons could be, it aligns with their personal brand or they’re super excited or passionate about the product – those are the kinds of reasons that could make it work, and we can help connect the dots there. How has the experience at WME Ventures differed from what you experienced earlier in your career at FirstMark or Flatiron? I think venture has changed dramatically over the last 10 years. When I first worked in venture you’d have 1-2 firms in a deal and now there is likely to be many more than that. Why have the syndicates gotten so much larger? It’s part size of the rounds, it’s part the number of firms and the dynamic around big and small firms. There’s a lot of reasons for it. Back to learnings – from the standpoint of the entrepreneur, I think the entrepreneurs higher expectations of their capital partners. The move towards real demonstrable value creation and partnership will only increase over time. And as we have more and more capital sources that are better positioned to do that whether they’re creating those functions internally, which we see a lot of venture firms doing, or players like us who already are practitioners in those spaces and can just plug and play. We’re looking at areas where we have an outsized advantage. Sports, media and entertainment are three areas, but we also look at next gen retail – marketplaces and consumer goods – where it’s easy for us to add value. What does the prototypical WME Ventures portfolio company look like? We’re looking for companies with strong management in a position to accelerate growth. If it’s pre-product the company is in a place where we believe they can get to product-market fit quickly. We’re in companies like HOOKED. We’re in the Series A of Glossier, they’re progressing really nicely. MasterClass just closed an additional round of capital. It’s deep vertical expertise and strong team and real product-market fit are the three main things we look for. What mistakes do entrepreneurs make when pitching to you? And how much of that do you think is informed by expectations they may have of WME Ventures given the traditional talent agency side of the house? I think both entrepreneurs and other people in the ecosystem have the misperception that, if it’s a media company or if the company could quote “benefit from celebrity” that that would be something we would be looking for. Those are both areas that we look at, but opportunities in those spaces are not necessarily a slam dunk. I have two observations from the standpoint of having spent over a decade as an operator. One, more and more businesses that are built today are technology enabled, versus creating technologies. And two, I don’t want to say the ideas are easy, but it’s all about execution. I think the biggest place where entrepreneurs will trip up is on the executional plan. Our operational experience gives us an advantage in evaluating companies. It prepared us to better understand what’s possible, how the entrepreneur is thinking about it, how will unit economics will work, what they’ll you do from a marketing perspective and how that will accelerate the business. Put it this way: I wouldn’t be surprised if you saw more COOs moving to VC. Let’s talk about corporate venture capital more broadly. The space is expanding; the data point I hear recently was 25% of venture dollars come from CVC. According to CB Insights, a record number of CVCs made their first investments last year (107). Why is the space so compelling to large corporates? I think there’s a couple of things. One, from the standpoint of innovation, it’s a way to learn. Some corporate organizations are very explicit about that, and I think companies need to make the right decision about whether it makes sense for their business or not. Two, there are companies with a lot of capital on their balance sheet it’s a way to utilize assets on their balance sheet to drive additional value. Three, back to what I mentioned before around entrepreneurs being more exacting about the value their capital partners bring to the table, there are some corporates that have lots of expertise and can bring that value to these companies. For an entrepreneur, what are the most important things to vet out about a CVC? There are many, many great corporate venture capital groups. I think you’re asking the right questions that entrepreneurs should be asking as far as what a VC, corporate or otherwise, can and can’t do – that’s an important part of the diligence process for any entrepreneur raising money. In many cases, these are large companies that can make large things happen. Picking the right partners for you can really drive change in your business, and there are some organizations where that’s easier to do than others. Teasing that out is important. In an interview last year you said the face of venture capital was changing and there was an opportunity to create your own culture instead of being forced into an existing mold. What did you mean by that, what mold and changing how? It’s about changing the thought process around who needs to have a seat at the table. The great news about where we are today is this is part of the conversation. It’s not just about gender, but other diversity as well. This diversity will also extend to the firms themselves – both in structure and people. From the standpoint of, “why are entrepreneurs being more exacting,” well, there’s a lot more choice and more interested in this space. That’s only going to continue. The good news is it raises the bar for everyone. On the gender side of it, none of this will happen on its own, and I do believe it’s the opportunity and the responsibility of all women to help others in their journey. Parity Partners is one way, but we all have the ability to contribute, not only by giving opportunities on our teams but also by being mentors to other women. You’re co-chair of the Leadership Council at Tech:NYC. Tell us about Tech:NYC and what about its mission resonated with you? I’ve spent my entire career in New York and I grew up in the tech space here. The ecosystem has made tremendous strides, but there’s a lot further to go. We can make progress by working with local and state government around issues that are important to our ecosystem. Ultimately, what we’re driving at is, how do we make New York an even more conducive place to build a business. What work needs to be done to make NYC a more conducive place to build a business? One is to raise awareness that there are lots of successful companies here. Two is finding ways to make setting up a company here easier. Three, making sure from a legislative standpoint that New York remains a great place to build a business. Can New York overtake Silicon Valley as the epicenter of innovation and entrepreneurship? I believe it’s possible. We have a real ecosystem of diverse businesses that we’re the leader in. We’re the leader in finance, advertising, fashion, media, etc. When you have a workforce that is trained in those areas, and these are some of the areas where we’re going to see massive innovation, New York increasingly becomes a great place to start these companies. Speaking of the tech community in New York, early in your career you worked with two luminaries of the community, Fred Wilson and Jerry Colonna, back in the Flatiron Partners days. What was that experience like and what did you learn from them? Working at Flatiron was an absolutely incredible experience. Fred and Jerry were not only very analytical and exacting around the sorts of businesses they looked for, what they believed worked and what they believed wouldn’t work. But more importantly, once we were invested, they were incredible partners to our companies. They were the first call the CEO made. They were real consiglieres to their CEOs and added a ton of value both inside and outside the board room. I thought that was the normal way; I thought, “that’s what you do as a VC.” Obviously that’s what most VCs aspire to, but fast-forward to later in my career – as I worked in operating companies I realized that wasn’t always the case. At Flatiron we went through a lot. We had an incredible period of growth and then an incredible period of very difficult times for our portfolio. Looking back, these guys were so steady, didn’t panic, and worked with the companies to think through what the right solutions for the business and then helped their CEOs get there. What would your portfolio CEOs say about you as an investor? What I aspire to with my founders is that they feel like they can bring anything to me; that I’m not here to evaluate them, I’m here to be their partner, and that I am someone that can help them through the challenges they’ll face and will help them through those things. I want to be the first call. Harry Potter – not only a great story, but its quality time with my two boys as we read them together. Most underhyped part of the tech ecosystem? Ecommerce infrastructure. There is no question ecommerce will continue to boom and these companies will benefit from better tools and services. Somewhere between NASCAR and Premiere League.